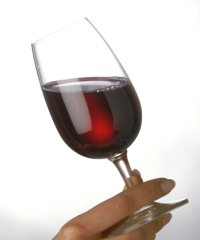 Pinot Noir is a noble grape variety (vitus vinifera). It generally produces light to medium bodied ruby-hued red wines with great capacity for ageing depending on its region, producer and style. Classically known to produce the revered red Burgundy wines in France, it is now grown around the world. Pinot Noir prefers cooler climate growing regions to maintain its freshness (acidity) and is notoriously difficult to grow. It is a heartbreakingly sensitive grape with thin skin (which is also why the wine is lighter in colour than many other red wines) and is particular about the soil it is grown in. It is best made from vines, which have been cropped low (fewer grape clusters per vine create a better final wine) and careful handling of the grapes after harvest is imperative. There are many schools of thought on how to handle Pinot Noir before and during fermentation and each producer believes their method is most suited to their Pinot Noir clones and grapes. Classically, Pinot Noir's common descriptors include: Red fruit (red cherry, raspberry, red current, cranberry), leather, forest floor (compost, damp foliage and earth), violets, barnyard (a mix of leather, horse and manure). As it is found around the world, it takes on the character of the place it's grown - its terroir. The kingdom of Pinot Noir is believed to be Burgundy France, but other cool-climate regions are having great success with this variety. New Zealand has very unique world class versions coming from Central Otago, Waipara and Marlborough on the South Island and Martinborough/Wairarapa on the North Island. Australia's Yarra Valley in Victoria, Walker Bay in South Africa, Oregon State in the USA, Sonoma County in California, Germany, British Columbia and Ontario. It is gathering popularity in the far reaches and cooler regions of Chile and Argentina as well. There are pockets of pinot Noir grown almost everywhere around the world. Pinot Noir (along with Chardonnay and Pinot Meunier) is also famous as one of the three grape varieties used in the making of Champagne - the world's most iconic and pricey sparkling wines. Perhaps no other variety evokes such passion and floral prose as Pinot Noir. It is called the heartbreak grape and has been the catalyst for many personal epiphanies due to it's feminine character and silky texture. A wine that shows classic Pinot character is said to have good Pinosity.